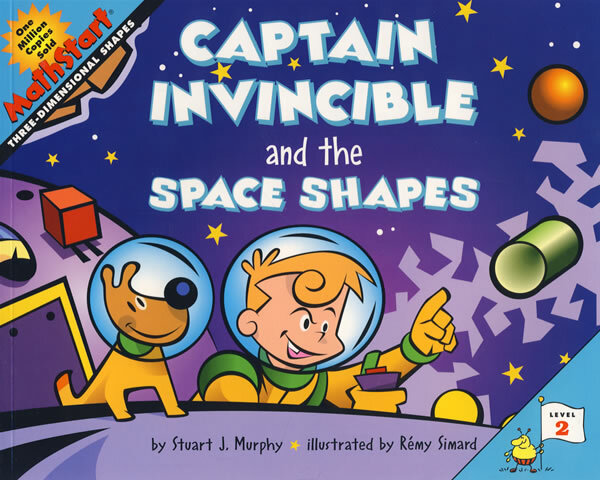 书籍简介: Kindergarten-Grade 4-An excellent tool for introducing a unit on three-dimensional shapes.After conquering galaxies,Captain Invincible and his space-dog,Comet,prepare for an adventurous return to Earth in their spaceship Hawk.Using the Space Shaper panel,with its three-dimensional buttons that include a cube,a cone,and a pyramid,the captain and the pup wage a battle against a meteor shower,poison gas,a flying saucer,and a galactic beast.Just as the two are about to land safely,a beam of light floods their spaceship,and an open bedroom door reveals the true source of this journey-a child's late-night,wondrous imagination with the help of paper,scissors,and Scotch tape.The bold cartoon art in deep,bright colors draws readers into this fun and exciting story that is a vehicle for learning to recognize and define geometric shapes.The concluding reinforcement strategies and activities are very good.A good choice as a read-aloud or for independent reading. STUART J.MURPHY has two eyes.With one eye,he developed his interest in visual learning,design,and art direction,And with the other eye,he created the MathStart series-children's books in which pictures do more than tell stories;theyteach math. A graduate of the Rhode lsland School of Design ,Stuart J.Murphy lives with his wife,Nancy,in Evan ston,lllinois.